Fragrant, flower ‘bombs’ of colour all summer. A cottage garden must-have, peonies are very easy to look after and produce huge, blousy flowers which fill the garden with colour and scent. Often available as smaller plants, we have been lucky enough to secure some premium quality, large bare-root herbaceous peony plants. Sized at 3-5 eyes (the largest available), these roots should form 3 to 5 stems and flowers in the first year. Secure yourself a classic English border plant that will flourish and delight for 30 years or more - simply getting bigger and better. Supplied as a large 3/5 eye bare root plant, will produce 3-5 stems/flowers in first year. 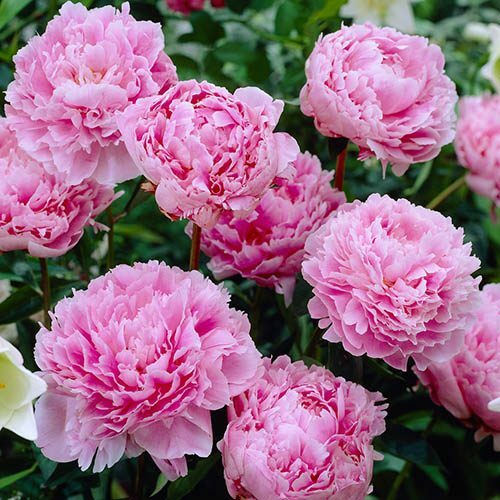 Peonies are a cottage garden must-have and are becoming increasingly popular as both a cut flower and a specimen plant in a large patio pot, where they add romance and glamour to any setting. These reliable perennial plants have huge, blousy flowers which fill the garden with colour and scent and can be brought into the home as cut flowers to brighten up the dullest windowsill. 'Dr Alexander Fleming', is an outstanding herbaceous peony producing large, highly fragrant, rose-pink double-ruffled flowers on sturdy plants throughout summer. The plants themselves form an upright bush of dark green leaves, remaining attractive all season. Often available as smaller plants, we have been lucky enough to secure some premium quality, large bare-root herbaceous peony plants. Sized at 3-5 eyes (the largest available), these roots should form 3 to 5 stems and flowers in the first year. Sold by specialist Paeony growers and RHS Exhibitors at much higher prices, you can secure yourself a classic English border plant that will flourish and delight for 30 years or more - simply getting bigger and better. Plant in autumn or early spring as the soil warms, where they can remain in active but slow growth, they really are very easy to look after and make very fashionable cut flowers every summer. Supplied as a large 3/5 eye bare root plant, shallow plant straight out at 5cm (1in) depth over the crown. Will produce 3-5 stems/flowers in first year. Supplied as a large 3/5 eye bare root plant, shallow plant straight out at 5cm depth over crown. Will produce 3-5 stems/flowers in first year. Peonies need winter cold and summer sun to produce flowers, so don’t plant the crown deeper than 5cm (2in) below soil level. They need plenty of water as long as they don't get waterlogged, so plant your peonies in soil that drains well. Clay is fine as long as it doesn't stay wet. Peonies flower at their best in full sun, but they will tolerate light shade. Feed with a general fertiliser in spring, but avoid over-feeding with high nitrogen fertilisers. To conserve moisture and suppress weeds, mulch around the crown with 5-7.5cm (2-3in) organic matter. Avoid covering the crown itself. It is generally best to cut the foliage to ground level as it dies back in the autumn to reduce risk of peony wilt.